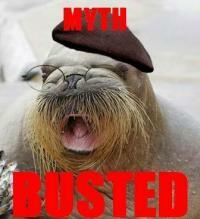 ASOIAF, Harry Potter, Wheel of Time, Rammstein, and Walruses. It is done. I have read ever single book in the Wheel of Time saga. I have just started it... Do you know that in Serbian, the series contains more than 20 books? Don't forget to come up for air! Drop in and say "Hi!" to your friends at TTTNE. It's too late, i'm already halfway through!! Finished Crown of Swords, halfway through Path of Daggers. WoT? I like RJ's storytelling but his characters lack flexibility. Most of them follow patterns based on some preset traits that he mentioned at some point. He ends up with well over a 100 characters whose story-lines he must keep track of. It's an extremely ambitious project for a writer. Not to mention that some of the main female personalities are indiscernible over longer chapters (I remember confusing Egwene for Nynaeve during their inner monologues). But I'm probably being unfair; it's still a fascinating world he created. Roughly 70% through The Fires of Heaven, and still loving every moment of it. Just started the Shadow Rising, and i'm enjoy it so far. Keine Ahnung, wo ich bin. Sag du's mir.